Are the assessments of military men necessarily reliable regarding where, when and how to apply military might? A disastrous assessment was made by Germany's military command in 1914. Their plan, the Schlieffen Plan, was to attack France through Belgium. It was disastrous politically. Germany claimed to be fighting a war of self-defense, and Germany would have been better off just defeating the French invasion and watching the political repercussions in Paris while standing guard along their border. But let us look at some assessments by US military commanders. Prior to Pearl Harbor, General Douglas MacArthur said that it was unlikely that the Japanese would attack the Philippines and that the Americans, British and Dutch could handle the Japanese with half the forces they had in the Pacific. MacArthur did well in agreeing that Japan's Emperor Hirohito should remain as a figurehead, and MacArthur did well in allowing the defeated Japanese some dignity. During the Korean War he made a good move invading at Inchon. But he was mistaken a month later when he assured President Truman that victory was won in Korea and that the Chinese would not intervene. Truman wanted a limited war in Korea. MacArthur wanted to extend the Korean War into China. He was insubordinate and Truman agreed with the Pentagon that he should be fired. Truman's belief in a limited war was seconded by President Eisenhower, who took office in January 1953 and ended the war with a negotiated settlement in July – short of the bloody mess that would have occurred in trying to overthrow the communists in China. Another general opposed to the settlement of the Korean War was General Mark Clark, the commander in Korea from 1952. He too wanted to extend the war to China. Against North Korea he used more force than was needed, accomplishing nothing by bombing the North's reservoir dikes, flooding the North's sparse agricultural lands and splashing napalm across North Korea's cities (an assessment that displeased Winston Churchill, who had returned as prime minister for Britain, a participant in the Korean War). Next we have the numerous unrealistic assessments of General Westmoreland in Vietnam. 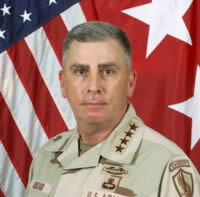 And moving to November 2006, we have General John Abizaid, commander of US forces for the Middle East region. He spoke of "significant progress" being made in Iraq and rejected Senator McCain’s calls for increased US troop levels, saying that he had “met with every divisional commander" and had asked them whether bringing in more American troops would "add considerably to our ability to achieve success in Iraq." The answer of these divisional commanders, reported Abizaid, was "no." So who should we look to for reliable assessments regarding the applications of military force, if not active duty military commanders? In the United States that is the job of the commander-in-chief – the President – who, if he is wise draws from advice from a variety of sources, some of it scholarly. Active duty military commanders can be consulted, and they usually are, through the Joint Chiefs of Staff and the Secretary of Defense. And there is Congress. Regarding war the president needs the approval of Congress. Congress does well when it consults with those who are scholarly and expert, and Congress represents its constituents, the American people. Big decisions about war should be a collective effort, befitting our representative democracy.